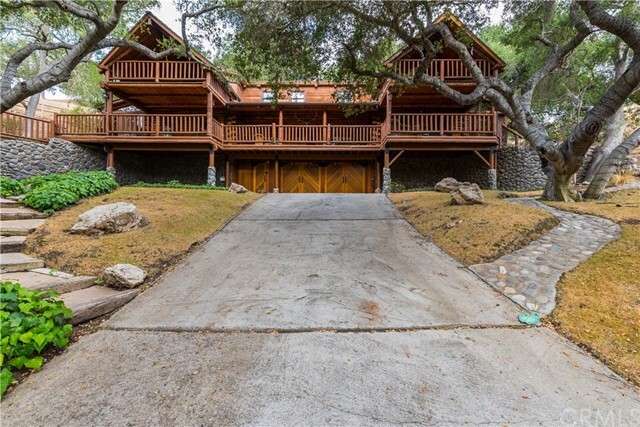 You don't have to be an equestrian to love this 20 acre gated horse property nestled in the hills of Santa Ynez. Gorgeous panoramic views of the Santa Ynez Valley and Mt. Figueroa can be seen atop the property hills. Large stable has a tack room, wash room and 2 birthing stalls. Open space leading up to the stable and stalls can be used as a corral. There's an additional barn structure at the start of the corral with many shelves to store your ranch tools. Take advantage of yet another large barn structure with hatch locking doors and space to accommodate your tractors and an RV. This barn is equipped with a small loft, kitchenette and bathroom. Small guest house, referred to as 'Little Bear Cabin' sits just before the main house. Little Bear Cabin has a kitchenette, bathroom, living room and below ground level bedroom and bonus room. The custom built log cabin main house is 3 stories and has a wrap around deck and many balcony areas. The basement level has a big laundry room, bonus room, 'fall-out shelter' pantry room, and granny unit. The granny unit can be accessed through the garage or main house. Putting green for the golf enthusiast.